Volvo Construction Equipment demonstrated that they are dedicated to the growing North American wheeled excavator market during their fall press briefing at their Shippensburg, Pennsylvania, manufacturing and customer experience facility. According to the company, the wheeled excavator market in North America is on pace for 23 percent growth in unit sales for 2016–2018, while Volvo is on pace for 60 percent growth in share of total unit sales for North America in 2016–2018. During that time, Volvo has introduced seven new models of wheeled excavator, including three replacement models. 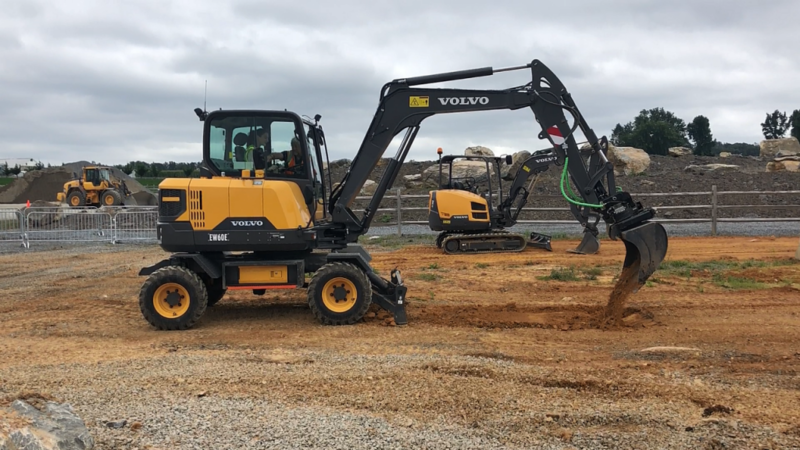 These models cover six size classes ranging from the 5- to 9-ton class to the 23-ton class, and include the introduction of Volvo's first dedicated material handler for North America, the EW240EMH. The jobsite of the future was a key theme throughout the event. Press toured Volvo's Uptime Center and War Room where the company emphasized the growing importance of the ongoing relationship between customers, dealers and the OEM as a vital pillar of the company's quest towards zero accidents, zero emissions and zero unplanned downtime while achieving ten times the efficiency on the jobsite. The company introduced the Volvo Services portfolio, which makes it easier for customers to choose the combination of Volvo services that will best fit their needs. New Volvo machines will also come with a revamped standard package of services – free of charge. Volvo Services covers nine categories of services including uptime services such as ActiveCare Direct, fuel efficiency options, advanced productivity solutions such as Load Assist and Dig Assist, safety services including Volvo Smart View and Speed Limiter, new life solutions such as Reman components, Genuine Volvo Parts, Volvo attachments, Volvo Financial Services and rental services. Designed for the waste and recycling industries, the new EW240E material handler is a powerful and reliable machine for challenging work conditions. "This is not an example of a manufacturer simply taking an existing machine and modifying it to fit a market. The EW240E was developed specifically for the waste and recycling segment," said Matthew McLean, product manager, Volvo Construction Equipment. "With a newly designed centre frame mounted on a reinforced undercarriage with 9-foot axles and extra-wide outriggers, the new material handler is ideal for medium-duty applications such as handling waste material blocks and loading and unloading scrap." The 26-ton EW240E material handler has a 173-hp Tier 4 Final Volvo D6 engine. With a straight boom measuring 21 feet 4 inches and a 16-foot 5-inch gooseneck arm, the machine has a maximum reach of 36 feet 9 inches.